Now look what I have here, my friends. A pearl. A very deadly pearl that you can only get to gawp at if you watch this dazzling 69-minute movie made in 1944. 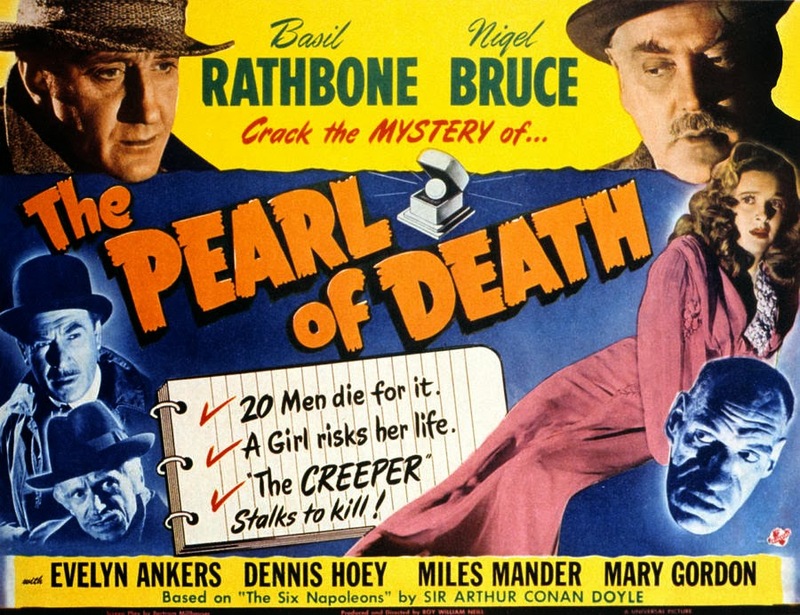 It was Directed by the sparking: Roy William Neill, and it Starred those diamonds in the rough: Basil Rathbone, Nigel Bruce, Evelyn Ankers, with Rondo Hatton. Why did I do it, Doctor Watson (Nigel Bruce)? Why did I feel the need to demonstrate to the curator of the British Museum that his security system wasn't able to safeguard the Borgia Pearl properly? I mean, for crying out loud! It was only the previous night I dolled myself up and retrieved it from that sultry swindler, Naomi Drake (Evelyn Ankers). And now, on the day of my demonstration, the mastermind who orchestrated Naomi to swipe this pearl in the first place, Giles Conover (Miles Mander), has used this opportunity to steal it out from under our very noses. OK. I admit. It was fortunate that Inspector Lestrade (Dennis Hoey) and his men were at hand to catch Giles before he could get too far away. However, during the short interim Giles was hidden away from prying eyes, somehow he managed to conceal this very valuable item and won't tell anyone where it is. So what should I do about it, old chap? Should I just stand around and hope Lestrade can coax this information out of him? Or better yet, should I just sit back and take all of that abuse spouted about me in the press because of my ill fated demonstration? No. I don't think I will do any of these things, my friend. For I am the consulting detective, Sherlock Holmes (Basil Rathbone), and I know why what next transpires becomes slightly sinister, when another one of Giles' henchman makes himself known. As the Creeper (Rondo Hatton) begins his attack - a sprung booby-trap ultimately goes thwack - six Little Napoleons eventually take a crack - and at the end of the day, a bad guy better watch his damn bloody back. 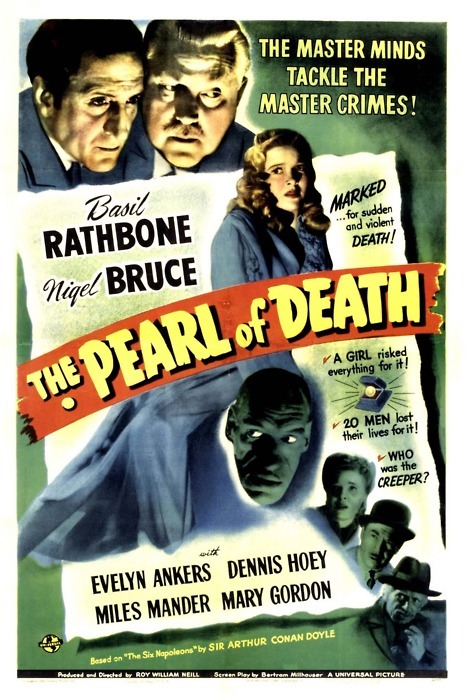 To be absolutely honest with you, folks, the only thing I could find at fault with 'The Pearl of Death' was that on three separate occasions the plot-line relied heavily either on happenstance or illogical behavior. Now the first scene I'm referring to is the one where Giles was at the right place, at the right time, for him to steal the Peal whilst Sherlock was performing his security demonstration. I mean, what a lucky beggar! Huh? The second scene was the one where Sherlock allowed Naomi to get away after she attempted to swindle from that man, because... well... why should he let her walk away Scott Free? It doesn't make any sense, right? And the third scene was the one where Sherlock was able to trick Naomi, because how in the hell did he know Giles was going to hang up on her during their telephone conversation together? But wait up! Let me just state for the record that not everything is doom and gloom where this great movie is involved. Apart from these slights dip in the story-line, the rest of it was very suspenseful and character-driven to watch. Take that incredibly gripping scene where Giles sneakily gave Watson that book-shaped booby-trap for instance. As soon as he was left alone with it, I couldn't help but squirm about on my sofa concerned that he'd kick the bucket by prying its lid open. And I have to say my fret wasn't released until Sherlock eventually came into the room and deduced what really was going on. Also, something else I failed to refer to in the aforementioned scene -- and something else I really did like about this movie too -- was how Sherlock, Giles, and Naomi, kept on playing 'dress up' so they could outsmart their opponent at every given turn. You see, in my eyes this nuance gave this flick an extra added ingredient where characterization and plot-development was concerned. Not only did it allow each of the actors to illustrate another side of their craft. But it also enhanced the overall narrative with a suspenseful angle that allowed this adventure to be more adventurous. Anyway. I think that's enough of that for the moment, dear reader. Here. Let us now have some filmic-facts. (1) 'Universal' first released this production in America on the exact same day the Red Army captured Tallinn. It was on the 22nd of September, 1944. (2) Loosely translated, this project was entitled 'The Pearls' in Spain; 'The Pearls of the Borgias' in France; and 'The Fateful Pearls' in Sweden. (3) Just like many of the other Holmes movies shot for 'Universal', this one was also filmed at 'Universal Studios', Universal City, situated within the American state of California. (4) There were three taglines used to promote this picture. The first one was, 'THE SECRET OF THE GEM OF DOOM!'. The second one was, 'The master minds tackle the master crimes!'. And the third one was, 'Marked... for sudden and violent Death! A Girl risked everything for it! 20 men lost their lives for it! Who was the Creeper?'. (5) This film was limply based on Sir Arthur Conan Doyle's 1900 short-story, 'The Adventure of the Six Napoleons'. (6) If you look very closely at Sherlock's cluttered Baker Street apartment, you will notice that he has in his possession a photograph of a beardless Abraham Lincoln. Hmm. Very curious that. (7) Now is this is coincidence or not? In one scene Holmes tells Watson that if he's wrong about the pearl's hiding place, he will retire to Sussex and keep bees. And do you know what? That's exactly what he does upon his retirement. 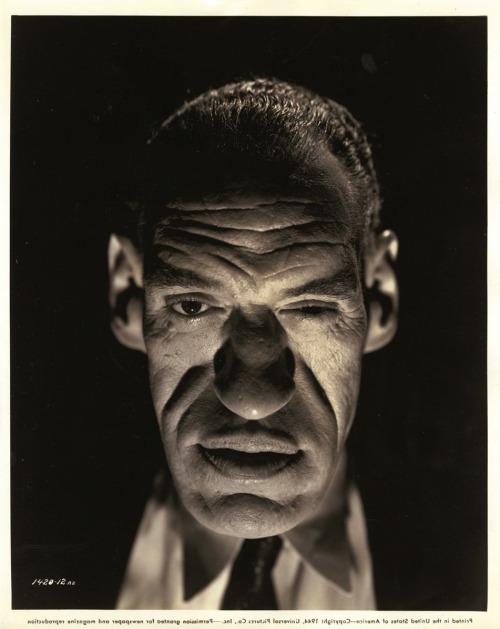 (8) Rondo Hatton, who played the part of the Creeper in this production, would play a character of the same name in two follow-up films not related to this one. Both of them would be released after his death in 1946, and they were entitled, 'House of Horrors' and 'The Brute Man'. Now before I bugger off to Baker Street, please allow me to mention that I did enjoy hearing Holmes barking orders to all of those people around him. 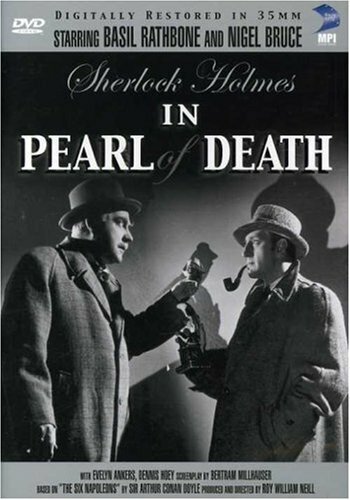 Even though at times it did sound a little bit rude on screen -- especially when he directed his attentions towards Doctor Watson -- in a round about way this personally trait kind of defined 'The Pearl of Death' for yours truly. It was occasionally abrupt. It was frequently harrowing. And it was chock full of character and individuality.